Olsen Motorsport is a vehicle repair, service, and restoration company based in Wisconsin USA. 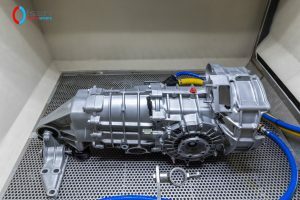 Not only do they accommodate for a variety of high end companies such as Porsche, Ferrari, Aston Martin and Lamborghini they also provide their service to custom built services and custom-built vehicles. Olsen purchased an Aquablast 1215 to process vehicle parts in their workshop based in Wisconsin. 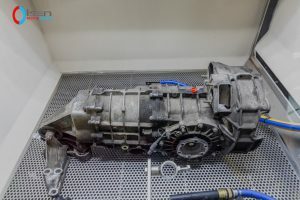 After purchasing the Vixen wet blasting machine this enabled Olsen Motor Sport to pass specific inspections and produce a consistent factory finish. 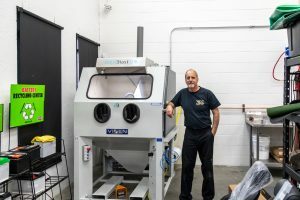 Olsen Motorsport purchased the Aquablast 1215 because it had such a spacious blasting chamber enabling them to maintain shop tools and equipment alongside processing parts.